Mr Charles Leinkram, a member of The Melbourne Hernia Clinic, specialises in the treatment of complex incisional hernias. Incisional hernias can be difficult to repair due to their large size and the fact that adverse patient factors, e.g. obesity, diabetes, smoking etc. are often associated. 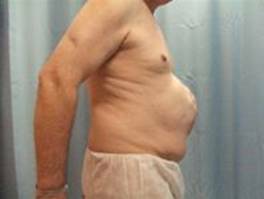 Moreover the patient has sometimes already had one or more failed attempts at repairing the hernia. Mr Leinkram employs a technique of an open intraperitoneal repair of the hernia using a large sheet of a double-layered non-adherent mesh which is sutured securely to the deep surface of the anterior abdominal wall. This is followed by closure of the hernial defect. At times, a radical abdominoplasty is also carried out to produce a much improved cosmetic appearance. Additionally, in several cases it has been necessary to resect a segment of incarcerated intestine contained within the hernial sac, with no adverse outcome in spite of the presence of the mesh. Mr Leinkram recently carried out an audit on his patients who have undergone this type of incisional hernia repair. There have been 26 consecutive patients reviewed over a period of between 6 and 48 months post operatively. There were 11 males and 15 females, aged between 38 and 76 years. 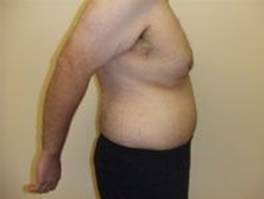 12 patients were morbidly obese, 3 patients underwent concomitant segmental small bowel resection and 12 patients had an additional radical abdominoplasty. A 22cm x 15cm sheet of Surgimesh™ was used in all cases. There have been no deaths. 2 patients, both of whom also underwent an abdominoplasty, developed wound infections. 1 patient required inpatient treatment with vacuum dressings, whilst the other patient merely required wound packing on an out-patient basis. Both wounds healed completely. 1 other patient required a laparotomy for adhesional bowel obstruction two years following her hernia repair. At operation, the adhesion was found to be totally unrelated to the mesh and in fact there were no adhesions whatsoever adherent to the mesh itself. This patient made an uneventful recovery. There were no other post-operative complications. To date, there have been no hernia recurrences, and on direct independent questioning, patient satisfaction has been found to be high. Below are “before” and “after” photographs on a sample of the patients. 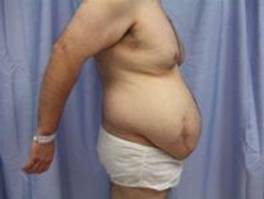 A 41 year old morbidly obese woman who developed a port-site paraumbilical hernia following a laparoscopic cholecystectomy. She underwent an open mesh repair of the hernia. Postoperative wound infection necessitated that the mesh be ultimately removed. She underwent 2 further laparoscopic incisional hernia repairs with mesh, both unsuccessful, and presented to us with a large central incisional hernia. 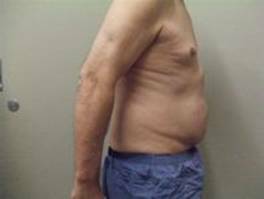 We carried out an incisional hernia repair combined with an abdominoplasty. 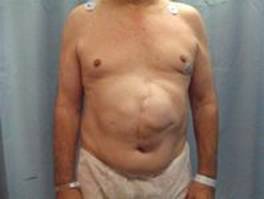 A 58 year old man from Western Australia underwent a laparoscopic hiatal hernia repair five years ago. He developed a leak postoperatively, requiring a laparotomy. A stormy course subsequently necessitated a further laparotomy to drain a subphrenic collection. He eventually recovered, but a few months later developed a large incisional hernia in the upper abdomen. 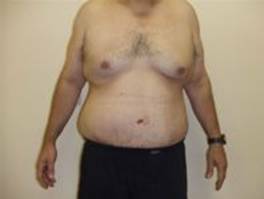 We repaired his hernia and the postoperative photos were taken at 10 days, just prior to his return to WA. 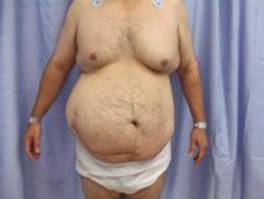 A 49 year old morbidly obese man with Type II diabetes who a few months earlier had undergone an apparently difficult appendicectomy. He subsequently developed a large incisional hernia in the RIF. When first seen by us he was advised to lose 20kgs in weight. We operated on him 5 months later, when he weighed 110kgs. 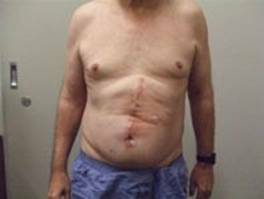 The incisional hernia was repaired in conjunction with an abdominoplasty.